The special Texas House committee appointed by Speaker Joe Straus to scrutinize Gov. 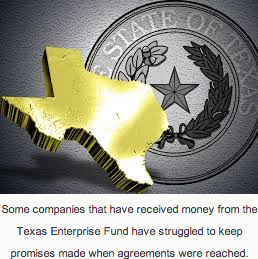 Perry’s job-luring pots of money – chiefly the Texas Enterprise Fund – got down to work last Wednesday. In its first hearing, the House Select Committee on Economic Development Incentives listened to expert witnesses for and against the incentives that were called everything from “interstate job piracy” to essential “tools in the toolbox” for continuation of the state’s dynamic economic growth. The Texas Enterprise Fund, according to the state’s numbers, has been used to invest more than $560 million in businesses that either moved to Texas or expanded operations here. 75,000 jobs have been created as a result, according to those state numbers. The TEF and the Emerging Technology Fund, both used and touted by Perry over the years, have come under fire from some on the right who call them “tax cronyism” and some on the left who say they amount to “corporate welfare.” In asking lawmakers to study this, Speaker Straus said “We owe it to taxpayers to take a detailed look at what has worked and what can be improved.” Some programs may need “retooling” and others have possibly “outlived their usefulness,” Straus said. LeRoy pointed to two examples of large firms signaling that infrastructure and a skilled workforce are much more important to them than receiving a monetary incentive. Toyota, he noted, is moving its headquarters to Plano from California for reasons that have little to do with the $44 million in cash the company’s getting from the city and state. What was far more critical in Toyota’s decision, LeRoy said, was proximity to the company’s existing manufacturing operations in San Antonio and a location in the Central Time Zone. Toyota is working on what some analysts have called a “Dixie strategy” of placing their plants in southern states, which added to Texas’ appeal for its North American headquarters. The move, as you may know, will bring an estimated 6,000 jobs to North Texas and add $7 billion to state’s economy. Texas Instruments has been working with community and state officials to include the University of Texas at Dallas as a strategic educational partner. Under the original agreement for the manufacturing facility, it was decided UTD would receive $300 million from the Texas Enterprise Fund, the UT System, and private donors to improve its engineering and research programs. LeRoy called Perry’s efforts at recruitment of some smaller firms “interstate job piracy” and said it’s been “microscopic” in the overall jobs picture. Rep. Chen Button said she respectfully disagreed with LeRoy. What the state is attempting to do, and has done successfully, is compete for business on a national and international level, Chen Button said. Rep. Jason Villalba, R-Dallas, was more forceful and said there are those like LeRoy who sit in an “ivory tower” and judge these programs in an academic way without considering what they mean to real people who are getting a paycheck. “That one job matters to my community,” Villalba said. He called it “asinine” for anyone to say that Texas should not pursue every single job possible. Villalba also mixed it up with Bill Peacock of the Texas Public Policy Foundation, which has called for the phasing out of these funds. Peacock said sarcastically during the hearing that it “seems like everybody wants free money from government!” After that, Villalba said that TPPF’s analysis is “sometimes suspect,” pointing specifically to their highly publicized and misleading statistic that government spending in Texas grew under the budget passed in 2013 by 26 percent. Peacock said there is a moral argument to be made that it’s simply not right to take the tax dollars of average Texans and give them to multi-million dollar corporations. When Villalba pressed Peacock on his assertion that use of the incentive funds has had no positive impact on the Texas economy, Peacock answered “We would believe it’s low taxes, low regulation, less government.” Villalba shot back that lawmakers, when setting public policy, can’t deal in the abstract like ideologues at a think tank. “We don’t live in black and white,” Villalba said. “We have to live squarely in the middle and deal with the cards we’re dealt,” he said. 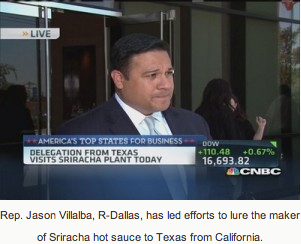 Kelley Rendziperis, a principal with a company called Site Selection Group, agreed with Villalba’s premise. “You see other states trying to figure out what Texas is doing,” she said. While the immediate availability of a skilled workforce is a much bigger driver of the conversation when companies decide where to locate, Rendziperis said “incentives matter” greatly. “I’m not suggesting it’s the first thing they look at but it can be a gigantic differentiator,” she told the committee. But there are those who simply see the continuation of these funds as bribes and crony capitalism. The committee plans to have its study of the issue wrapped up in November. This article was originally published in The Quorum Report. Copyright July 23, 2014, Harvey Kronberg, www.quorumreport.com, All rights are reserved. Reprinted with permission.